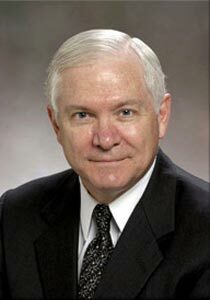 Robert M. Gates is the only employee of the Central Intelligence Agency to rise all the way through the ranks from entry-level spook to Director of the CIA. He was hired in 1966 while a student at Indiana University, and in his long career at the CIA he no doubt had many impressive accomplishments, but most details remain classified. It is known that Gates was a career Soviet analyst who had no notion that the Soviet Union was about to collapse until, like other Americans, he saw it on TV. Gates was an executive assistant to President Carter-era CIA Director Stansfield Turner, and deputy to Directors William Casey and William Webster under President Ronald Reagan from 1986 until 1989. He was an assistant to President George H.W. Bush and Deputy National Security Adviser from 1989-91. In a December 1984 memo to his boss, CIA Director Casey, Gates recommended US airstrikes on Nicaragua, to destroy as many of its tanks and helicopters as possible, and weaken that nation's left-leaning but Democratically-elected president, Daniel Ortega. Gates wrote that the government of Nicaragua, closely allied to communist Russia and Cuba, was "unacceptable to the United States and that the United States will do everything in its power short of invasion to put that regime out", and further recommended that the US withdraw diplomatic recognition of Ortega's government, and instead recognize the Contra rebellion as Nicaragua's "government in exile". Gates was actually nominated to head the CIA twice. He was first nominated by Reagan in 1987, but the nomination was withdrawn when questions were raised about Gates' involvement in the Iran-Contra scandal. He had worked closely with several people who were publicly linked to the scandals, wherein weapons were sold to Iran and the proceeds were illegally used to fund the Contra rebels. He was certainly in a position to know what was going on, and he was accused of turning a deaf ear when whistleblowers came to him with information about Oliver North's actions, but Gates always claimed he knew nothing. In 1991, Gates was again nominated as CIA Director, this time by the first President Bush. Three former CIA employees testified against Gates' confirmation, on grounds that he had slanted intelligence to suit political policies, exaggerating the Soviet Union's strength to accommodate Reagan's view of the USSR as an "Evil Empire". Gates was confirmed by the Senate in November of 1991, and he was CIA Director for about 14 months, until President Bill Clinton's nominee, James Woolsey, took over in January of 1993. Since leaving the agency, Gates has been a frequent contributor to the editorial pages of the New York Times. From 1999-2002 he was Dean at the George (H.W.) Bush School of Government and Public Service at Texas A&M University. He became President of Texas A&M in 2002, and while running that school he was also Chairman of the Independent Trustees of The Fidelity Funds, the nation's largest mutual fund company. He was US Secretary of Defense from 2006-2011, and became President of the Boy Scouts of America in 2014.